Spring break is right around the corner, and you may find this a really exciting fact – or it could be a really overwhelming fact, too. While vacation is such a great thing during spring break, it’s not always a feasible option for all families, which usually includes mine. 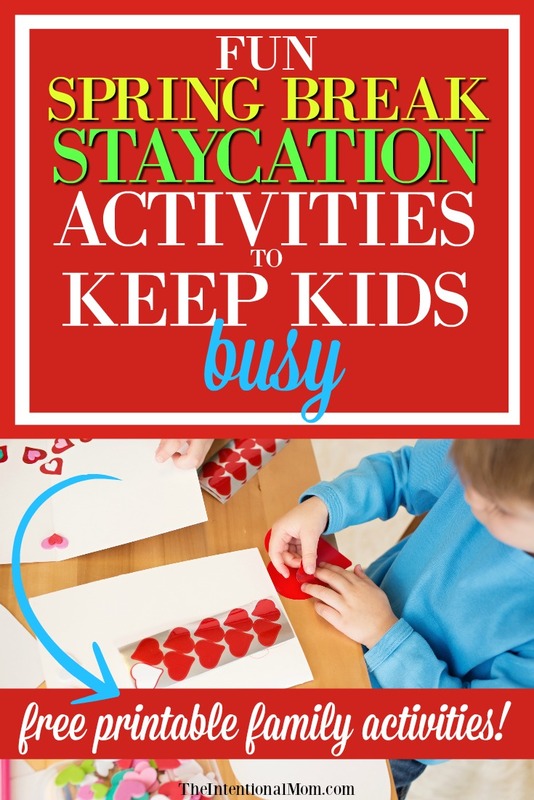 But, having a spring break staycation can be a fun time with some simple and fun planned activities for your kids. With something planned, there will usually be less boredom, less fighting between siblings, and just a little bit more spring break sanity for mom. Using just basic supplies that you most likely have on hand, you can create some fun for your kids for little to no money. And, you might even have a little bit of fun in the process. After all, busy kids usually make for happy kids. Here are some simple and fun spring break staycation ideas for families at home. These tracks can be as little or as long as you and your kids want. 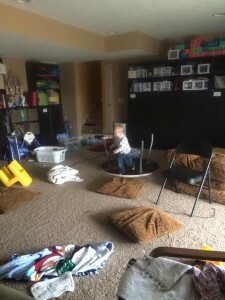 They can travel across all kinds of floor surfaces, and they can even incorporate some sort of obstacle course type features if you really want to have some fun. These can weave all over the floor and even up on the furniture if you choose. My boys love using their hot wheels on the track. We usually keep it up for a few days or even weeks at a time. I find painter’s tape doesn’t damage any of the surfaces that I put it in, and it can even be moved a few times if needed. 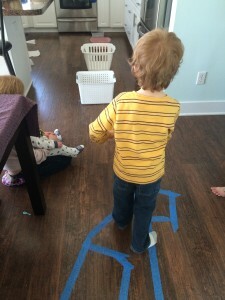 Your kids can usually make the tracks with little to no supervision, and just the act of building them is entertaining. This chute is made with old wrapping paper rolls, paper towel rolls, toilet paper rolls – whatever you have on hand. 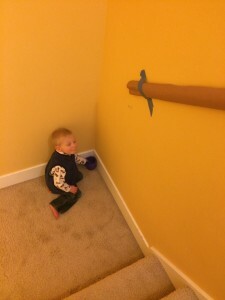 Simply attach them to the walls using painter’s tape, and it certainly doesn’t have to be perfect. The only caution is to make sure that there are no gaps in your chute. With gaps, the marbles will either get stuck or fall out. 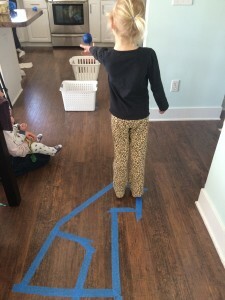 This activity may require more hands-on from a parent just to make sure the connections are good. It is fun just to send the marbles down, but we also add in taking turns trying to line up a cup underneath to catch the marbles and score points. Don’t kids always want points involved somehow?! 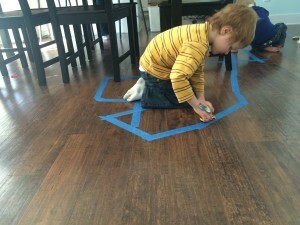 For this activity, you will be making a landing strip for paper airplanes using painter’s tape. This is nothing more than just making some parallel lines across the floor, roughly the same distance apart. 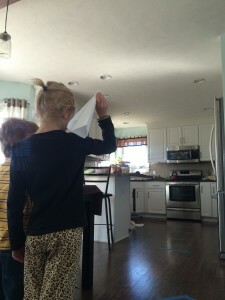 Once the strips are made, you can make some paper airplanes and have a contest to see whose plane can fly the farthest. Make this however you like it, but it is a great way to burn off some energy. 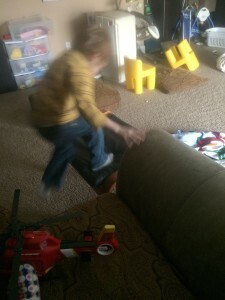 We often take pillows off couches, jump over stuffed animals, and roll around the floor. I will caution you: sometimes we have injuries, but this can just be part of burning off energy. 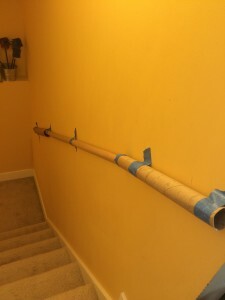 And, as long as your obstacle course is safe, the injuries in our home have always been minor. But, it is SO awesome to have a way for kids to burn off energy if you’re trapped inside, which often happens to us in Michigan over spring break. As much as we are ready for spring, mother nature usually doesn’t get the memo. Gather some bowls, buckets, and a ball. Set up your bowls, buckets, and baskets in a line, equally distanced apart. 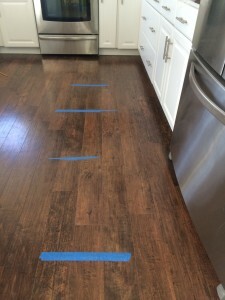 Then make a line with painter’s tape that will serve as your starting line or starting point. To play, everyone stands at the same point on the floor to do an underhand toss of the ball. One point for each bucket. We make our buckets, baskets, and bins get smaller as they go to make it more challenging for the older kids. 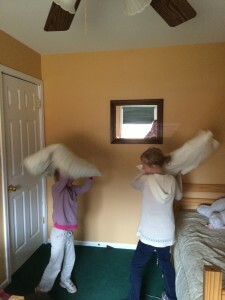 Another classic – having a pillow fight! I find kids are never too old for this. Supervision is advised here 😉 This is another super great activity for burning off some energy. This one was designed to be done inside the house for random things you know you have lying around. This is something that you can usually put together fairly quickly. While you can make it complicated, it doesn’t have to be. Even the simple ones are fun! Outdoor scavenger hunts are also fun if you have a safe place for your kids to go door to door asking for these random items. 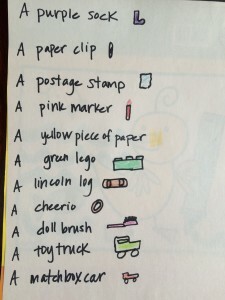 Much like the indoor version, you simple create a list of random items that need to be collected. Then, your kids go collect these items, or as many of them as they can, from neighbors. You can set a time that the scavenger hunt ends when teams will have to be back home. Then, the points are tallied and the team with the most items wins. Perhaps the best thing about this option is the aside from making the list, there is no prep work for you – yay! Kids love crafts, and with just a few ideas in mind, kids can be entertained for hours. If things will get a bit messy, be sure to cover the table and maybe the floor with a simple vinyl tablecloth that can easily be wiped up. Gather some ideas and supplies ahead of time so you’re ready to go. If you find yourself stuck at home from spring break, having some simple activities on hand to keep boredom at bay is a very, very good idea. Gather these basic supplies and be ready to help your kids have an awesome staycation on a budget. And, enjoy a little mom sanity in the process! Great ideas even if the weather is terrible! It’s raining here in the UK. We are also going to make Easter burning and an empty tomb cake (from Life as Mom http://lifeasmom.com/2010/03/empty-tomb-resurrection-cake.html). You’re welcome! We have cold weather here, we will be indoors for the next while. We make the empty tomb cake, too. Love it! Enjoy!